Lancaster Online reported last week on the reopening of a popular Lincoln Highway eatery. 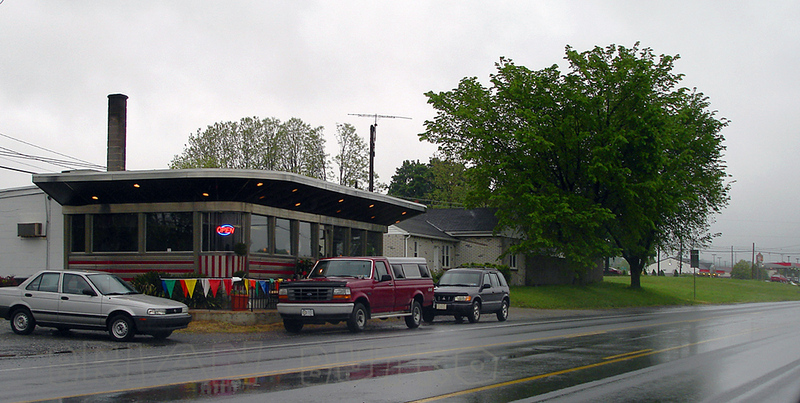 The Prospect Diner is along the Lincoln Highway (Columbia Ave/Rt 462) between Mountville and Columbia in the east-central part of the state. It had previously been known as Benji’s, the 3-D, and Keri’s, its name as it sat closed for the past year. New owners Michael and April Conroy have completely renovated the kitchen and and revivied seating area with lots of red vinyl along the counter, stools, and booths. The 1955 Kullman-brand diner, with a classic overhanging “outer space style” eave, features homestyle food for breakfast, lunch and dinner. Open 5 a.m. to 8 p.m. Mon–Sat; 6 a.m. to 3 p.m. Sun. Here it is on my trip last week – CLICK for a larger view. This entry was posted on May 22, 2008 at 8:42 am and is filed under food, highways, Road trip, roadside, travel. You can follow any responses to this entry through the RSS 2.0 feed. You can leave a response, or trackback from your own site. Too bad the old sign is gone from the top of the diner. Good to see it opened again. Hope they do well! Glad to see the last management is out, and that it’s reopened. Pity about the sign being gone, though, that was a particularly nice piece of neon.